Want to write an equation in slope-intercept form? Already have the slope and y-intercept? Perfect! Just correctly plug those values into your equation and you're done! Learn how in this tutorial. Want to find the slope-intercept form of a line when you're given a point on that line and another line perpendicular to that line? Remember, perpendicular lines have slopes that are opposite reciprocals of each other. In this tutorial, you'll see how to find the slope using the slope of the perpendicular line. 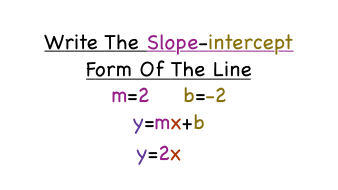 Then, use this slope and the given point to write an equation for the line in slope-intercept form. Check it out!